OK, first things first. Can you confirm or deny the rumors of your retirement? It seems that I’m not allowed to quit…last time I even suggested it a skater yelled at me, told me I’m never allowed to leave. 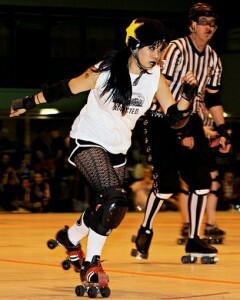 But I have a plan…I’m going to have to fake my own death and then move to the mountains of Montana and live off the land for the rest of my life where no derby girl can find me. Seriously though, having just ended my fourth season…I think five sounds like a nice round number to go out on. But that could of course change, and I could be threatened with enough bodily injury to keep me for a sixth season. What was the show idea? The focus of the show would have DSDG’s road to the National Championships. Once you win the contest they pair you up with people that actually put together shows so that they can guide you. They had me writing out episode ideas, synopses, writing the pitch reel script….I felt kinda weird because you’re just making up stuff that will happen about various skaters. I was sort of a wreck then because I was really out of my element since this was getting to be a huge project and I knew that there were 100 women that would loathe me if this turned out wrong. So I was very scared because as I shot more with ARG I sort of realized it wouldn’t have been good for the league. It would have been intrusive and it would have taken ARG’s focus off training and competing and landed some reality show on their lap to make up drama and stuff like that. As fate would have it, Turner sold my division the day after I handed in my final pitch reel for the show…so that sort of ended it right there. I did have a bunch of prominent people really egg me on to put my all into this show idea instead of find another job. The girl who did the voiceover for the reel, Kathryn Cressida, who has voiced a lot of characters work on Dexter’s Lab, Disney movies and a lot of video games…she called me up after I was done and said it was the best pitch reel she’d ever seen and tried to get me to head out to L.A. to keep pushing for it. As proud as I was of the piece it was probably best to just let it end there. Plus, I think I’d hate L.A…. I’ve heard you almost quit after making just a few videos? After the pitch reel was turned in I asked if I could work with marketing and make highlight reels for ARG since I got a small glimpse of the community and really wanted to be a part of it all. It was also at a time in my career where I still felt sort of like a “novice” in the whole video production realm so any chance to just work on stuff made me feel like I was growing as a shooter / editor. ARG let me come in and shoot the first bout of the season…and I think I did one more before news came down I was about to be unemployed. I wasn’t sure if making derby videos was a smart choice to continue with since I was trying to buy a house and had no career prospects after that job. Also, I had been editing the videos at work at night and used a coworkers camera to shoot the stuff. With losing the job, I had no place to edit and no camera gear. I had to buy all new equipment just to continue that. I came really close to just throwing in the towel. It’s great that I didn’t…not only for the derby experience, but also because met some great people who got me some other projects to work on. I will note that if you look at the first highlight reel, it was one video for both bouts…which came off kind of weird. So someone made the suggestion to produce 2 videos a month…doubling my workload. I’ll thank Sissy for that whole idea. 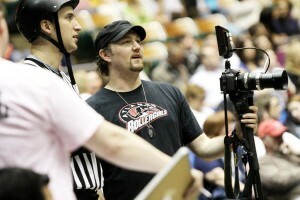 What makes a good derby video? What I do is really an extension of marketing. 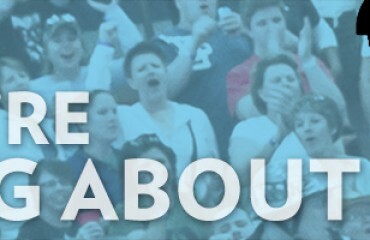 You really just want great energy to make it feel like this awesome sport…which it is! You want people that have never seen a bout to see the video and think it looks awesome so they buy tickets. And great gameplay does not really translate to what will look good on camera. Good, solid walls and blocking are sort of “meh” in my world…but for gameplay they’re key. Big hits, fancy jammer moves, interesting people in the crowd, any theatrics and just fast movement is always going to work the best. I do feel bad sometimes because there are a ton of great skaters that are under represented in the videos. And it’s not that they don’t do anything awesome…but it’s not that stuff that makes a good highlight reel. So I will apologize for all the skaters that might not have had as much camera time. It’s not personal, I swear! Not every league (and maybe not any other league) can say they have an Emmy winning videographer. Tell us about your win. I had been nominated a couple of times for various things I’d worked on through the years but had never won. This year, I did a pretty simple promo for The Big Bang Theory that got nominated. It’s kind of funny because it was all graphics. and I’m a mediocre graphic animator. We sent it in and ended up getting nominated for three different categories. I’m not really big on awards. I know some people that really strive to win them. It sort of validates them and they get a big head, acting like everything they do is pure gold. But honestly, winning an Emmy doesn’t get you a raise or really get you a job. It’s really just an aesthetic thing. The whole awards show is sort of boring, and I’m terrified of speaking in public which is sort of weird because I’m quite outgoing. When we won, I had to get up in this huge room of like a thousand people. I mumbled some thank yous and darted off stage with my buddy. 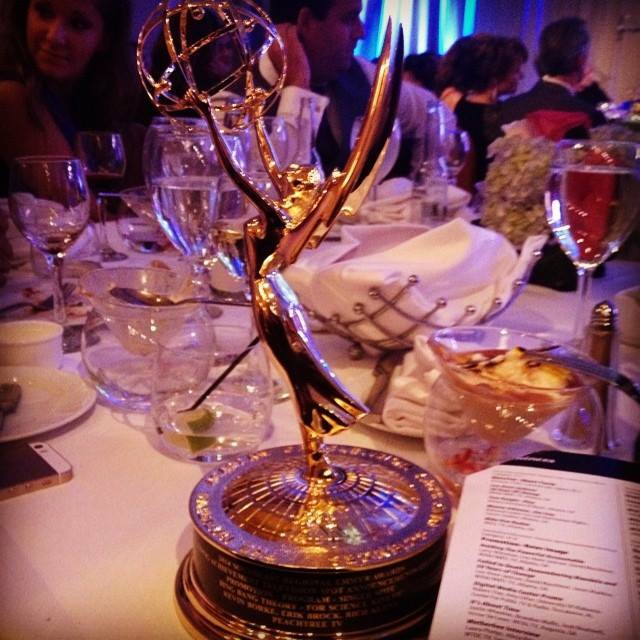 It’s cool to have the statue…it’s the same one that the National Emmys give out. And my cats like to try to chew on the wings. 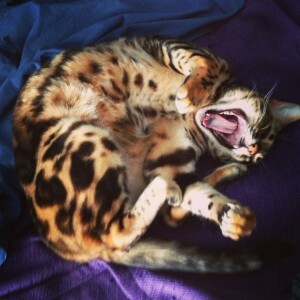 Speaking of cats, we want to know about this Bengal cat you’re purported to own. Also, if the cat could talk, which celebrity/famous person’s voice would it have? Hahaha….yea, the infamous Zim. We wanted a cat with a ton of personality and Bengals are pretty wild and just nuts. You know when cats do like that five minute freakout thing where they run everyone and just spazz out. Zim can do that for hours straight. As for celebrity voice…that’s a tough one. For our other cat we figured out that Matthew McConaughey was perfect since Lux is so chill and just goes with the flow. Zim however is pretty much an idiot with a lot of energy…so we thought sort of a Zach Galifianakis might work. The Intimidation of a Comeback.